Back in the 1950s, the movie theater was a venue for radical experimentation. As the home TV kept people rooted to their sofas and out of cinemas, Hollywood was bold in the way it used technology to lure people back to the silver screen. Cinerama was just one of those ideas—but one that crashed and burned. David Bordwell takes a wonderful trip down memory lane in his long and nuanced post about what was right and wrong about Cinerama. 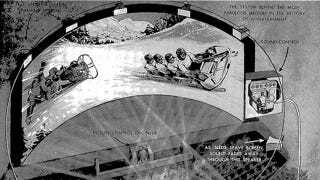 The set-up, which used three projectors to throw out a huge image over a screen which swept 146-degree arc, was well ahead of its time. Just like 3D today, it necessitated specialist cameras and far more thought than normal filming—but the effects were stunning.